The Tongariro Alpine Crossing (formerly the Tongariro Crossing) is often advertised as the best daywalk in New Zealand, and something that must be done. For many tourists to New Zealand, it’ll be their first experience, their only experience or one of very few outdoor experiences, meaning they’re unlikely to have appropriate clothing and gear. 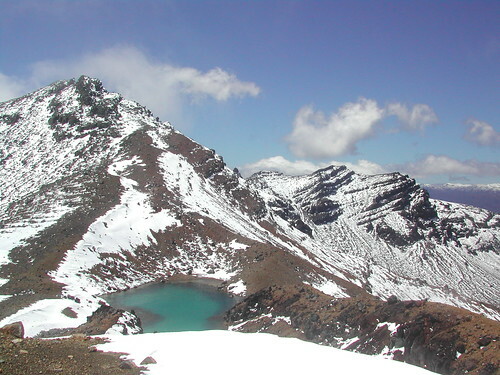 Tourists often come to New Zealand from places with very different conditions to New Zealand’s alpine conditions, possibly through tourist trails of other countries where it’s more difficult for tourists to get to dangerous places unsupervised, and aren’t prepared for what to expect, possible sudden changes in weather or other dangers. Some people set aside a specific day to walk the Tongariro Alpine Crossing, and arrange and book other parts of their trip around this date. If the weather isn’t appropriate on the day they’ve chosen, the go anyway. To demonstrate the changeability of the weather, these two photos were taken less than an hour apart during November 2007. I realise I’m 4 months late with posting this link. I’m afraid I don’t watch much television. This entry was posted in musing and tagged department of conservation, link propagation, media, musing, television, tongariro. Bookmark the permalink. came across this site for other articles, but am very much enjoying this place – keep up the good work! As to this video clip: I absolutely agree with the general message that probably the majority of people in the outdoors are badly equipped and prepared. I do take objection of the example given of the two women carrying six month old babies on the Tongariro Crossing though. Without any more information on how they were doing it, the fact that they had babies with them alone does NOT mean that they were doing anything irresponsible whatsoever. This kind of generalised journalism, making statements about something without spending much thought or research on the topic, breeds simplified thinking and doesn’t help anyone. I am a member of the Christchurch Trailbabies, an independent group of young families that do anything from day walks to overnighters and multi day trips with their babies, toddlers and young children. All of us know from experience that it does not so much depend on what you do with your children, but more on how you do it. Sure there are things I wouldn’t do – but it is entirely possible to spend two weeks of autonomous tramping in the mountains with babies, toddlers or young children, safely and enjoyably – if you do it right! That means you need to have sound wilderness skills, you need to be equipped and skilled to handle anything nature can throw at you safely, and you need to be able and willing to make good decisions in a timely manner. So no, you can’t just pack your baby and a muesli bar and go into the mountains – but if you do it right, there is nothing wrong with showing your baby or toddler the wilds. Hi Matt. Fair objection, and the presentation in the report is non-specific on that comment. You’d hope the person (was it a DoC ranger?) making the comment was also making a judgement on other things they saw with what the people were doing, even if it didn’t make it to the final cut. I annoyingly can’t get the video to play right this moment but I think I remember it. If I had a very young baby, I’m not sure I’d feel comfortable taking them too far away from short-notice medical help… but once they reach a certain stage I imagine it just becomes more a question of preparing things properly, as you say. Making good decisions for a group, whoever it includes, should be part of all outdoor recreation, to be honest. It’s a shame it often gets overlooked. only now had a chance to come back here and read your response – I think I would basically agree with what you write. The question that everyone needs to decide for themselves would be at how many months they feel happy to take their baby out. But it’s probably a sliding scale anyway – where you go, how far, for how long and other factors all can be adjusted to what you’re happy with, depending on age and health of your baby. Of course, another question would be how much better the outcome actually would be in the extremely rare case where something with the baby turns out not to be quite right health wise, even with medical help arriving in minutes. But we can only speculate about that, of course, and I am not suggesting any answer to that question either way. Finally, of course there are risks in spending time in the wilderness, even if you do things right. But that’s just the same with spending a day in the city or even at home – there is no such thing as a risk free life. I personally think that having a false sense of safety consciousness can also get to a point where it can be called reckless to prevent your children from making important experiences and learning important life skills in the name of safety by trying to protect them from everything that could potentially harm them. That can backfire really badly later on in their life, and it’s probably a lot more common (and, as such, unfortunately more accepted) than children having the odd accident in the wild (and, in contrast, in most cases learning something from it!). As with most things in life, it’s about good measure and balance. Of course, different people will have very differing views on this. Generally I think it is at least safe to say that parents who are thoughtful, well prepared and reasonably experienced, or have the help of someone experienced, can take their babies, toddlers and children into the bush and mountains much earlier and further than the vast majority of people unfortunately still seem to think. It’s one of those things which, because not too many people do it (yet! ), seems (!) to be something that can’t really be done. Will be interesting to see if that view changes in the not too distant future; there seems to be a slight but steady increase of families who go tramping with their children. I think it is very valuable for both children and parents to spend time in the outdoors together. 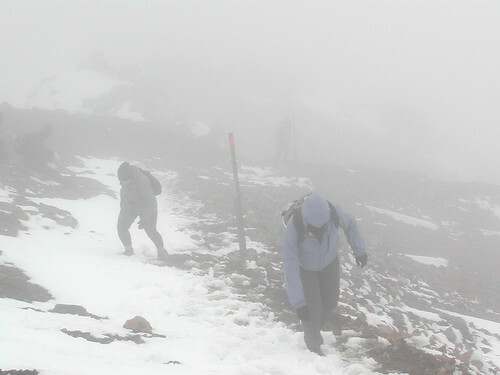 Another belated response, but with regard to the hour apart photos on Tongariro, I experienced something similar on Mt Ruapehu, but with less than ten minutes for the change from bright and sunny to in the clouds and snowy. It was an eye opener even knowing beforehand that that sort of thing could happen. Yep, I can definitely believe that. Thanks for the comment. I agree, the Tongariro crossing can be treacherous. I was once up there in mid summer, a beautiful day, then within an hour the temperature and visibility dropped to zero and it was snowing! This then meant we had to do some rescuing of tourists who were completely unprepared, providing them with some warm clothes and shelter under a big plastic sheet. Then, a couple of hours after that it was 22 degrees again and sunny! 1. Have 2-3 signboards at the beginning, at the start of the road, at the carpark and on the track that state NZ has a dangerous alpine environment where weather can change from sunny to snowing within minutes at all times of the year. And it needs to be in Chinese, Japanese, English and probably French and Spanish. 3. Indicate, by pictures, the necessary equipment (warm clothes, water, food and rain gear) that everyone should take. Also indicate there are no shops or places to buy anything on the route and indicate where they can buy this stuff (good business for National Park) before they go. Back this up with the number of tourists who were killed in NZ last year because they didn’t take the right gear (usually around 10-15 if my memory serves me correctly). In addition to this, DOC could make a small pack of a polypro, cheap jacket (even just a disposable long plastic jacket with elastic head/sleeve and body bits) muesli bars which it could sell at the hut at the start for $50 a pop as a “survival gear” pack for the crossing. 4. Create clear signposts indicating the direction to go… have a clear marker for “this is the way the Tongariro crossing goes (maybe colour coded?)”. This is particularly important at the top of Red Crater where people seem to get disoriented (including myself once or twice!). Twice I have come across tourists at other huts on the round Ngauruhoe circuit who veered off course from the Tongariro crossing and got benighted at a hut. Doing these things would make the place a lot safer I suspect! Ouch, sounds like they were lucky you were there. I’m not an expert but I’m not really convinced that sign boards and instructions to sign-in would be effective, especially since DoC already seems to have such things in many places and yet they still get ignored. I dunno — I think a lot of people just don’t have much respect for being told what to do, and simply fail to appreciate that it really is dangerous and potentially deadly if something out of their control happens to change on a whim. I don’t know how to fix this, but I think it’s a fundamental thing that goes deeper than adding a few more signs here and there. It’s all those things in the bullet points above, really — the last one is a classic heuristic trap. Someone’s thinking “it looks really dangerous out there and I shouldn’t go today because DoC says it’s unsafe”, but then they think “but today’s the only day so it’s as good as I’ll ever get and it’s the best daywalk in the world and less bad than it could be, so I’ll go today”. They’ll make a decision based on something completely unrelated to the safety situation despite possibly being already aware of it. Even experienced trampers do this with flooded river crossings all the time (“the hut’s just over there”, or “my car’s just over there”), which is why people who one’d think wouldn’t make such a mistake often still die in flooded rivers which they’d never have entered in other circumstances.